"This book is a wonderful introduction to one of history's greatest figures: Marcus Aurelius. His life and this book are a clear guide for those facing adversity, seeking tranquility and pursuing excellence." — Ryan Holiday, bestselling author of The Obstacle is the Way and The Daily Stoic The life-changing principles of Stoicism taught through the story of its most famous proponent. Roman emperor Marcus Aurelius was the final famous Stoic philosopher of the ancient world. The Meditations, his personal journal, survives to this day as one of the most loved self-help and spiritual classics of all time. 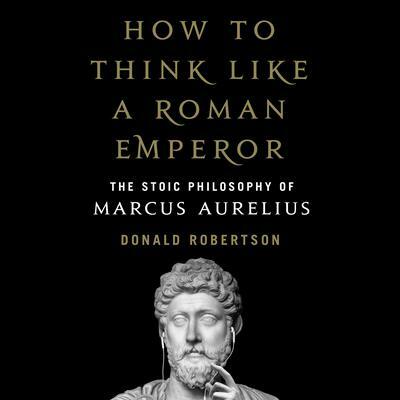 In How to Think Like a Roman Emperor, psychotherapist Donald Robertson weaves stories of Marcus’s life from the Roman histories together with explanations of Stoicism—its philosophy and its psychology—to enlighten today’s listeners. He discusses Stoic techniques for coping with everyday problems, from irrational fears and bad habits to anger, pain, and illness. How to Think Like a Roman Emperor takes listeners on a transformative journey along with Marcus, following his progress from a young noble at the court of Hadrian—taken under the wing of some of the finest philosophers of his day—through to his reign as emperor of Rome at the height of its power. Robertson shows how Marcus used philosophical doctrines and therapeutic practices to build emotional resilience and endure tremendous adversity, and guides listeners through applying the same methods to their own lives. Combining remarkable stories from Marcus’s life with insights from modern psychology and the enduring wisdom of his philosophy, How to Think Like a Roman Emperor puts a human face on Stoicism and offers a timeless and essential guide to handling the ethical and psychological challenges we face today. Roman emperor Marcus Aurelius was the final famous Stoic philosopher of the ancient world. The Meditations, his personal journal, survives to this day as one of the most loved self-help and spiritual classics of all time. 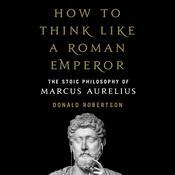 In How to Think Like a Roman Emperor, psychotherapist Donald Robertson weaves stories of Marcus’s life from the Roman histories together with explanations of Stoicism—its philosophy and its psychology—to enlighten today’s listeners. He discusses Stoic techniques for coping with everyday problems, from irrational fears and bad habits to anger, pain, and illness. How to Think Like a Roman Emperor takes listeners on a transformative journey along with Marcus, following his progress from a young noble at the court of Hadrian—taken under the wing of some of the finest philosophers of his day—through to his reign as emperor of Rome at the height of its power. Robertson shows how Marcus used philosophical doctrines and therapeutic practices to build emotional resilience and endure tremendous adversity, and guides listeners through applying the same methods to their own lives. Donald Robertson is a cognitive-behavioral psychotherapist, trainer, and writer. He was born in Ayrshire, Scotland, and after living in England and working in London for many years, he emigrated to Nova Scotia where he now lives. Robertson has been researching Stoicism and applying it in his work for twenty years. He is one of the founding members of the non-profit organization Modern Stoicism.